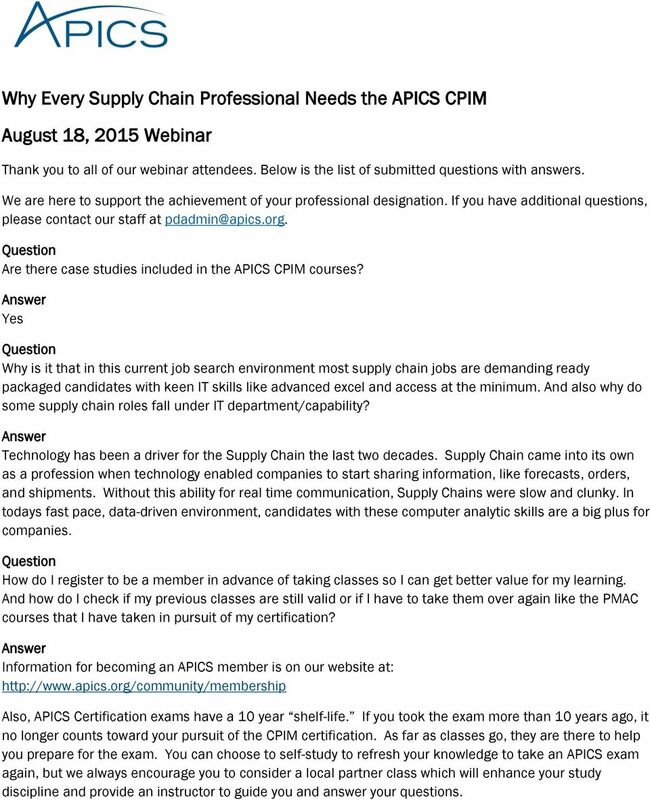 Download "Why Every Supply Chain Professional Needs the APICS CPIM August 18, 2015 Webinar"
1 Why Every Supply Chain Professional Needs the APICS CPIM August 18, 2015 Webinar Thank you to all of our webinar attendees. Below is the list of submitted questions with answers. We are here to support the achievement of your professional designation. 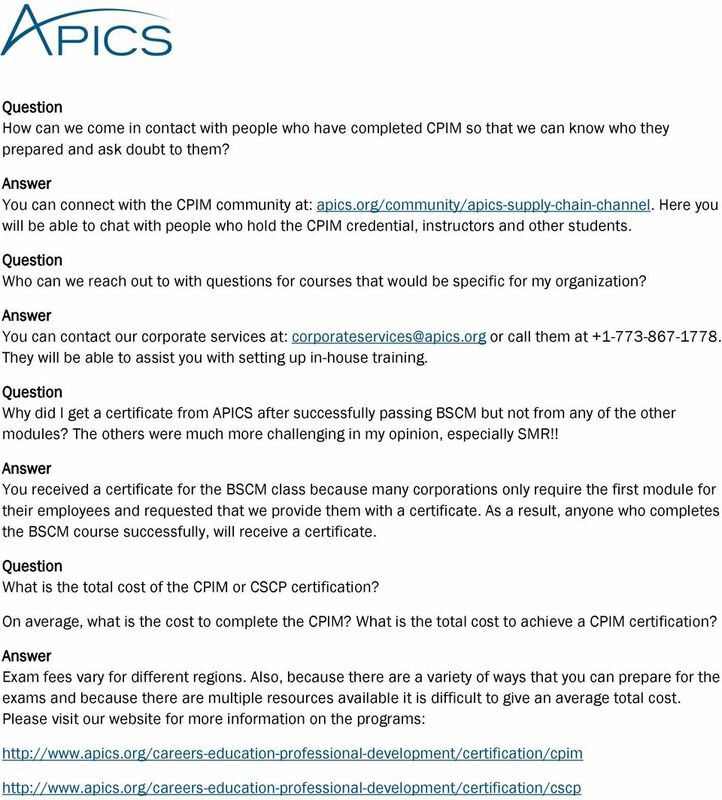 If you have additional questions, please contact our staff at Are there case studies included in the APICS CPIM courses? Yes Why is it that in this current job search environment most supply chain jobs are demanding ready packaged candidates with keen IT skills like advanced excel and access at the minimum. And also why do some supply chain roles fall under IT department/capability? Technology has been a driver for the Supply Chain the last two decades. Supply Chain came into its own as a profession when technology enabled companies to start sharing information, like forecasts, orders, and shipments. Without this ability for real time communication, Supply Chains were slow and clunky. In todays fast pace, data-driven environment, candidates with these computer analytic skills are a big plus for companies. How do I register to be a member in advance of taking classes so I can get better value for my learning. And how do I check if my previous classes are still valid or if I have to take them over again like the PMAC courses that I have taken in pursuit of my certification? 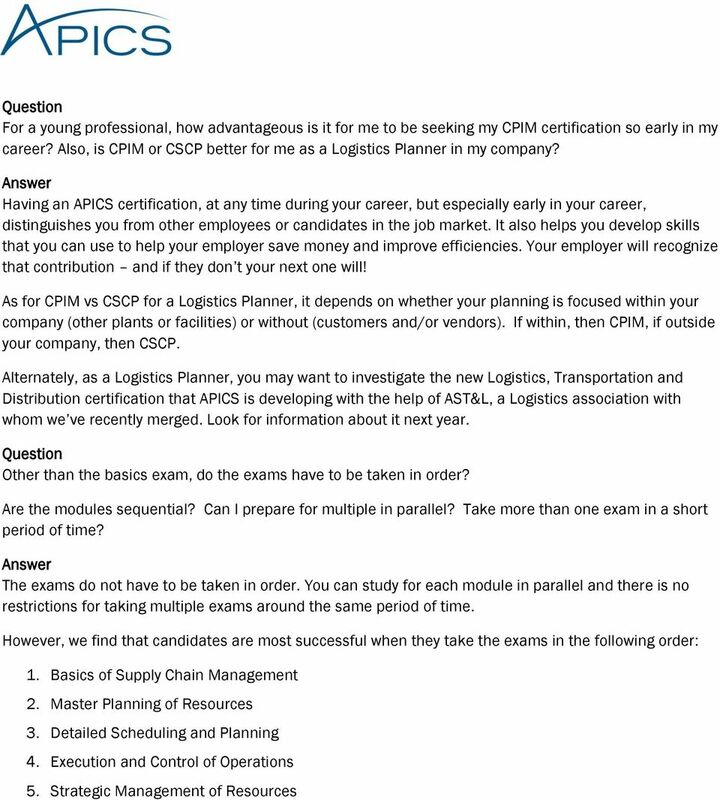 Information for becoming an APICS member is on our website at: Also, APICS Certification exams have a 10 year shelf-life. If you took the exam more than 10 years ago, it no longer counts toward your pursuit of the CPIM certification. As far as classes go, they are there to help you prepare for the exam. You can choose to self-study to refresh your knowledge to take an APICS exam again, but we always encourage you to consider a local partner class which will enhance your study discipline and provide an instructor to guide you and answer your questions. 3 Is professional expertise in SCM necessary to achieve the certification? How many years do you have to work in your field before testing for the CPIM? No, but it is recommended. There are no eligibility requirements for the CPIM certification. 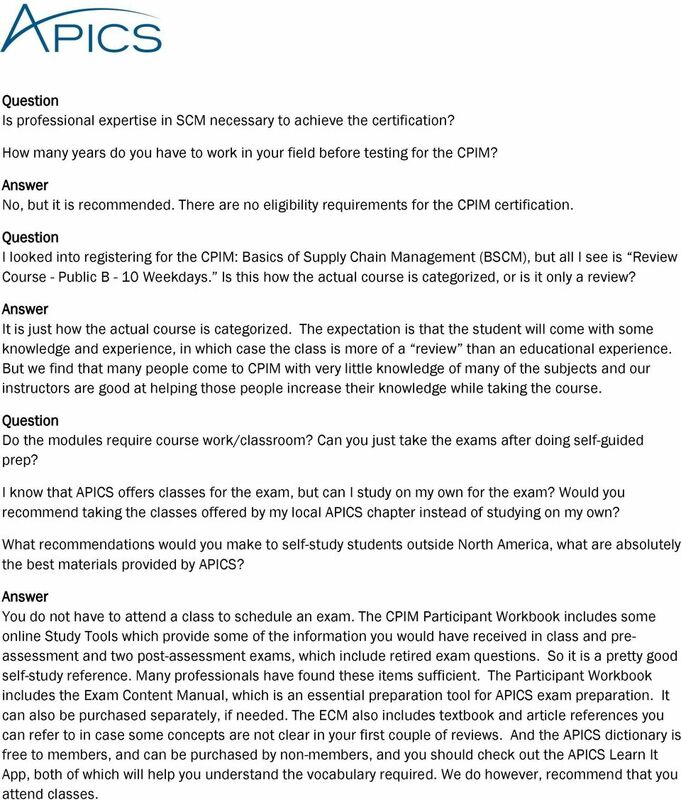 I looked into registering for the CPIM: Basics of Supply Chain Management (BSCM), but all I see is Review Course - Public B - 10 Weekdays. Is this how the actual course is categorized, or is it only a review? It is just how the actual course is categorized. The expectation is that the student will come with some knowledge and experience, in which case the class is more of a review than an educational experience. But we find that many people come to CPIM with very little knowledge of many of the subjects and our instructors are good at helping those people increase their knowledge while taking the course. Do the modules require course work/classroom? Can you just take the exams after doing self-guided prep? 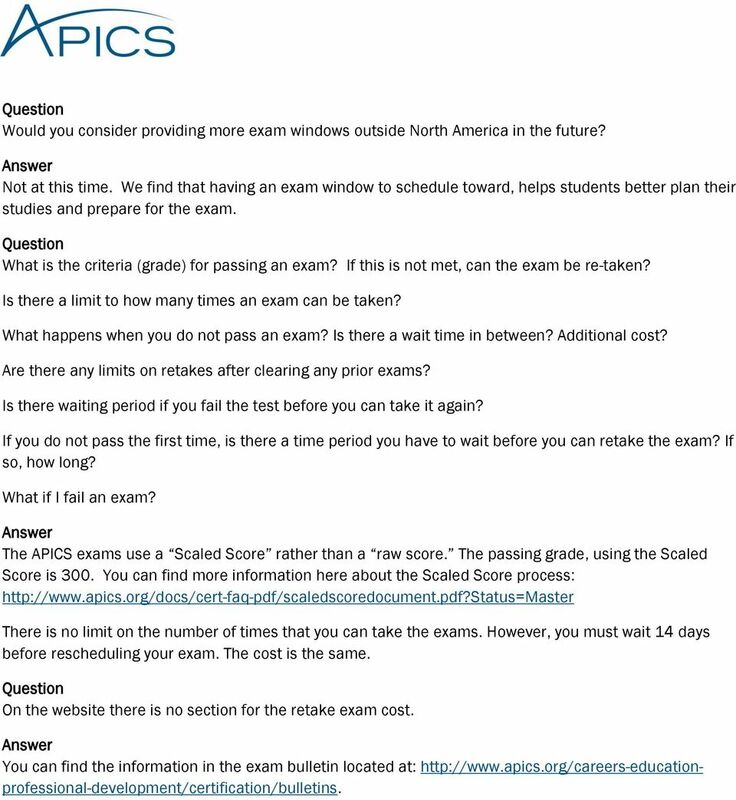 I know that APICS offers classes for the exam, but can I study on my own for the exam? Would you recommend taking the classes offered by my local APICS chapter instead of studying on my own? What recommendations would you make to self-study students outside North America, what are absolutely the best materials provided by APICS? You do not have to attend a class to schedule an exam. The CPIM Participant Workbook includes some online Study Tools which provide some of the information you would have received in class and preassessment and two post-assessment exams, which include retired exam questions. So it is a pretty good self-study reference. Many professionals have found these items sufficient. The Participant Workbook includes the Exam Content Manual, which is an essential preparation tool for APICS exam preparation. It can also be purchased separately, if needed. The ECM also includes textbook and article references you can refer to in case some concepts are not clear in your first couple of reviews. And the APICS dictionary is free to members, and can be purchased by non-members, and you should check out the APICS Learn It App, both of which will help you understand the vocabulary required. We do however, recommend that you attend classes. 4 Where do you take the tests? 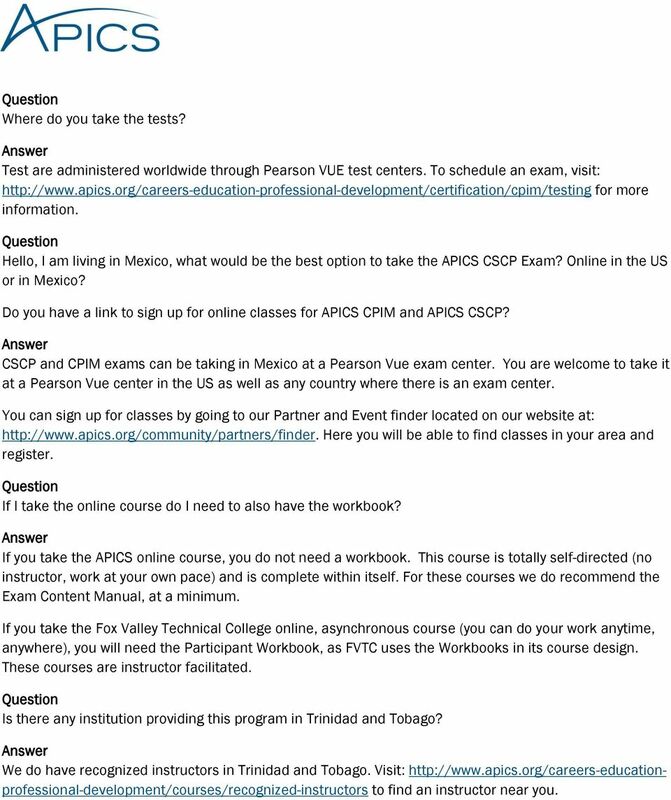 Test are administered worldwide through Pearson VUE test centers. To schedule an exam, visit: for more information. Hello, I am living in Mexico, what would be the best option to take the APICS CSCP Exam? Online in the US or in Mexico? Do you have a link to sign up for online classes for APICS CPIM and APICS CSCP? CSCP and CPIM exams can be taking in Mexico at a Pearson Vue exam center. You are welcome to take it at a Pearson Vue center in the US as well as any country where there is an exam center. You can sign up for classes by going to our Partner and Event finder located on our website at: Here you will be able to find classes in your area and register. If I take the online course do I need to also have the workbook? If you take the APICS online course, you do not need a workbook. This course is totally self-directed (no instructor, work at your own pace) and is complete within itself. For these courses we do recommend the Exam Content Manual, at a minimum. If you take the Fox Valley Technical College online, asynchronous course (you can do your work anytime, anywhere), you will need the Participant Workbook, as FVTC uses the Workbooks in its course design. These courses are instructor facilitated. Is there any institution providing this program in Trinidad and Tobago? We do have recognized instructors in Trinidad and Tobago. Visit: to find an instructor near you. 5 We did not hear much about the CSCP course? Can you please brief on the study material, exam dates and exam fees for this course. Can we have same kind of webinar for CSCP? We held three webinars for CSCP earlier this year. You can find the links to them in our event archive at: If I have passed some CPIM tests before but it's been about 10 years, do those still count? Is there a time limit from when you take your first test until you must complete all tests to obtain the CPIM certification? Once you've passed each exam, how long is it valid for? Exam scores are valid for 10 years. As long as they are within that timeframe they would still be valid. 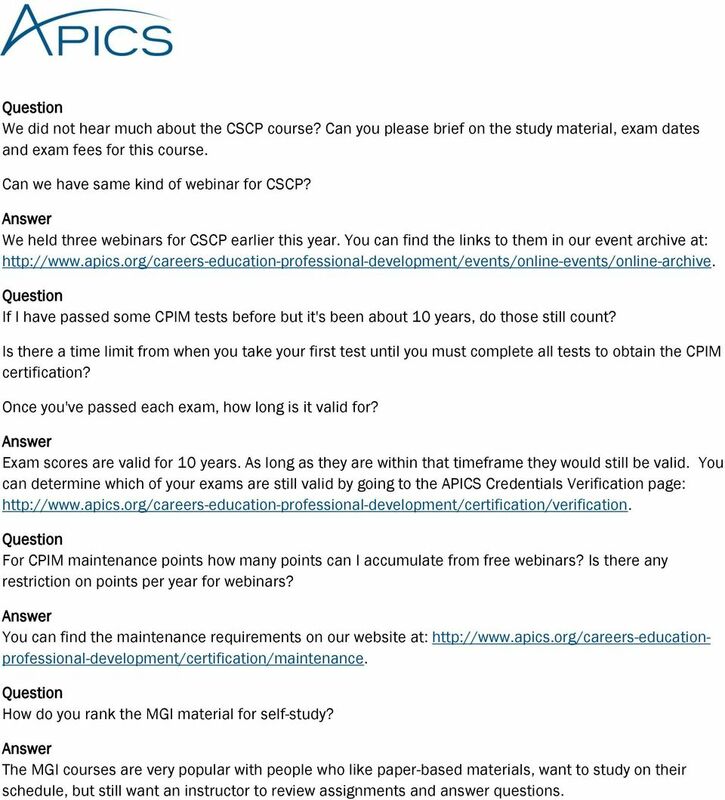 You can determine which of your exams are still valid by going to the APICS Credentials Verification page: For CPIM maintenance points how many points can I accumulate from free webinars? Is there any restriction on points per year for webinars? You can find the maintenance requirements on our website at: How do you rank the MGI material for self-study? The MGI courses are very popular with people who like paper-based materials, want to study on their schedule, but still want an instructor to review assignments and answer questions. 6 I was APICS certified about 1988/1989 but have not worked in the field for some time -- I am assuming that I should proceed like I am new to APICS? That seems to be the safest approach. You will recognize concepts and practices, but the courseware will help you remember what you once knew and teach you new concepts I am based north of Boston, where is the closest CPIM instructor-facilitated classroom coursework held? 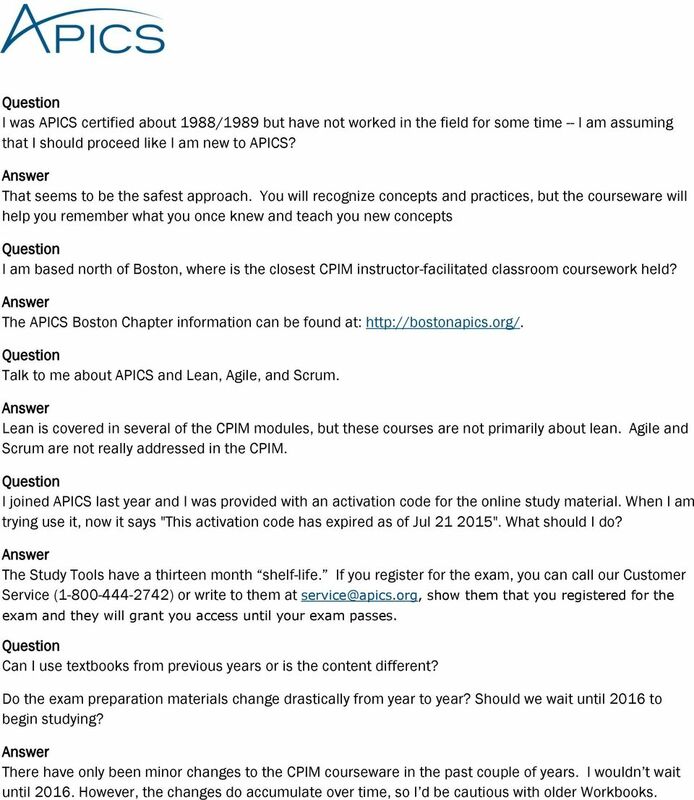 The APICS Boston Chapter information can be found at: Talk to me about APICS and Lean, Agile, and Scrum. Lean is covered in several of the CPIM modules, but these courses are not primarily about lean. Agile and Scrum are not really addressed in the CPIM. I joined APICS last year and I was provided with an activation code for the online study material. When I am trying use it, now it says "This activation code has expired as of Jul ". What should I do? The Study Tools have a thirteen month shelf-life. If you register for the exam, you can call our Customer Service ( ) or write to them at show them that you registered for the exam and they will grant you access until your exam passes. Can I use textbooks from previous years or is the content different? Do the exam preparation materials change drastically from year to year? Should we wait until 2016 to begin studying? There have only been minor changes to the CPIM courseware in the past couple of years. I wouldn t wait until However, the changes do accumulate over time, so I d be cautious with older Workbooks. 7 Can I take the module 1 exam outside North America and complete rest of the modules in North America? Can you change countries between exams? Yes. You are not limited to one country to take the exams. Do you recommend taking the CPIM first and then adding the CSCP? Or can you jump right into the CSCP? Do you recommend earning the CSCP after the CPIM or before? There are concepts in the Basics of Supply Chain course and exam (the first CPIM exam) that are very useful when taking the CSCP exam. But which one to take first depends on your goals and career needs and aspirations. If you schedule a test date and decide you are not ready, can you reschedule without paying extra? 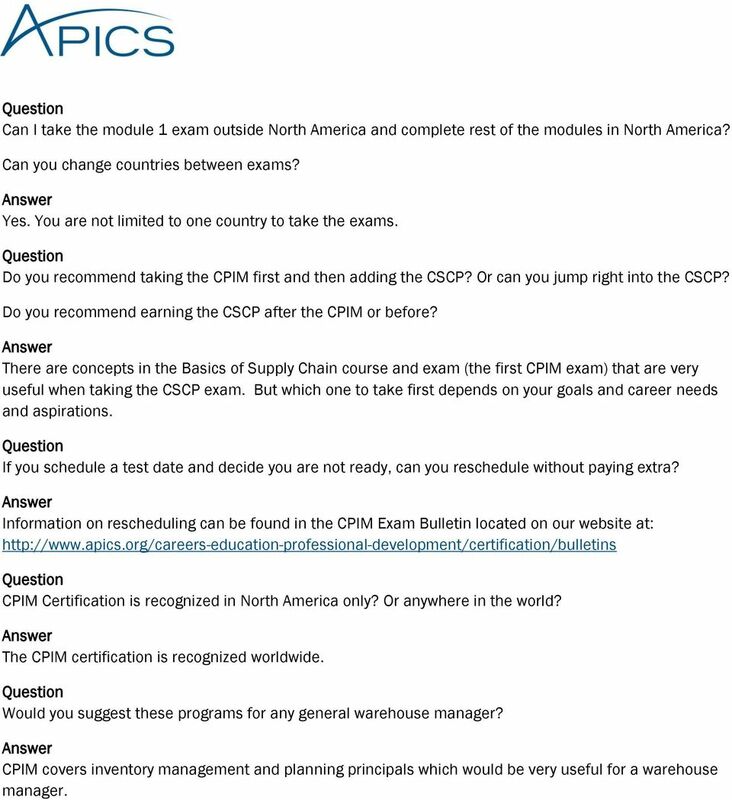 Information on rescheduling can be found in the CPIM Exam Bulletin located on our website at: CPIM Certification is recognized in North America only? Or anywhere in the world? The CPIM certification is recognized worldwide. Would you suggest these programs for any general warehouse manager? CPIM covers inventory management and planning principals which would be very useful for a warehouse manager. 9 Does the CPIM require continuing education or periodic recertification? Yes. The CPIM certification does require maintenance. Information on the maintenance required can be found on our website at: Which would be better for inventory managers, CSCP or CPIM? Definitely CPIM. CPIM has a great deal of information about Inventory Management, Inventory Accuracy, planning inventory, and so on. How are the test questions weighted? The test questions are not weighted, they are all equal. To pass the exam you must have a test score of 300 or greater on all of the CPIM modules. This discount is applied within North America only? How about other regions? The offer is good worldwide. 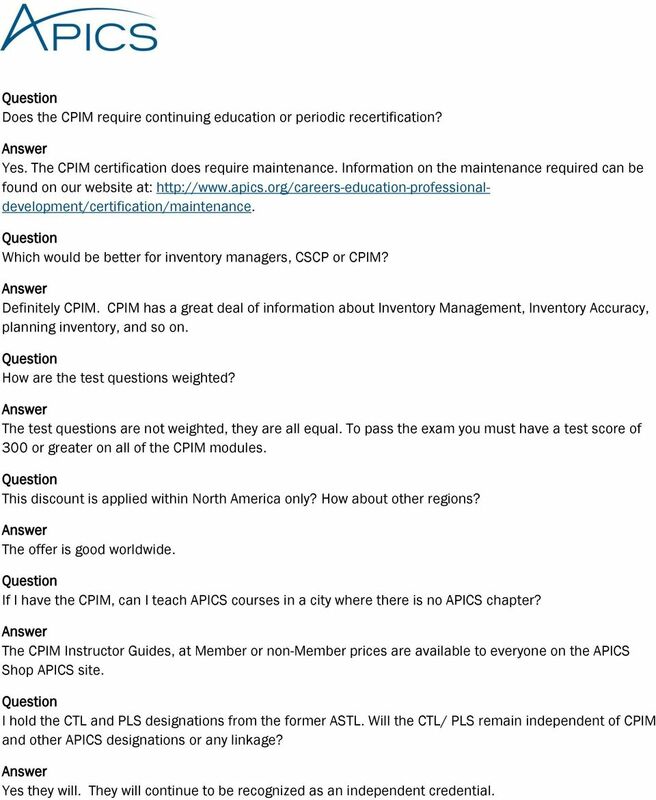 If I have the CPIM, can I teach APICS courses in a city where there is no APICS chapter? 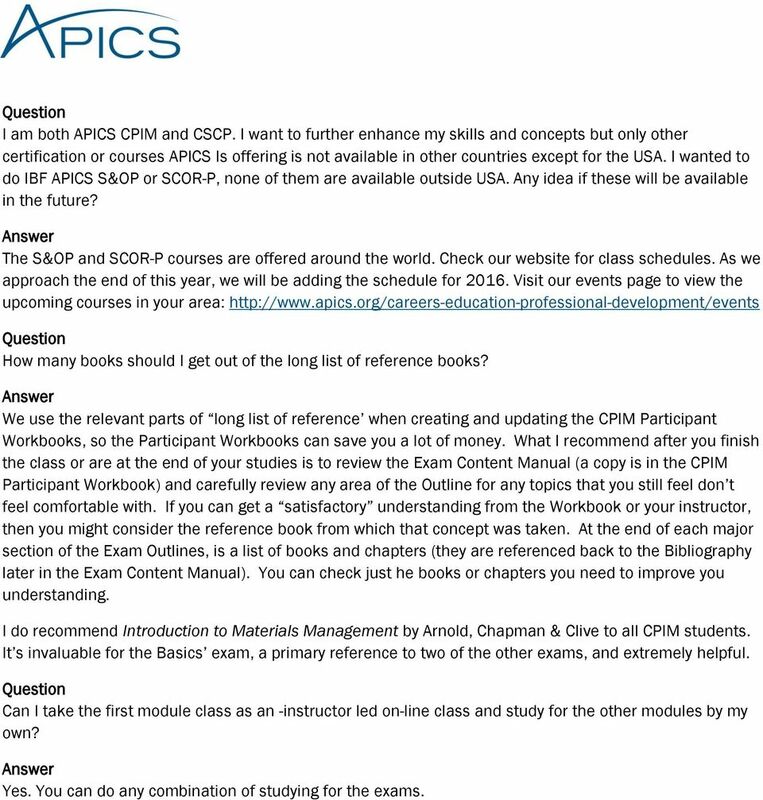 The CPIM Instructor Guides, at Member or non-member prices are available to everyone on the APICS Shop APICS site. I hold the CTL and PLS designations from the former ASTL. Will the CTL/ PLS remain independent of CPIM and other APICS designations or any linkage? Yes they will. They will continue to be recognized as an independent credential. 10 I am both APICS CPIM and CSCP. I want to further enhance my skills and concepts but only other certification or courses APICS Is offering is not available in other countries except for the USA. I wanted to do IBF APICS S&OP or SCOR-P, none of them are available outside USA. Any idea if these will be available in the future? The S&OP and SCOR-P courses are offered around the world. Check our website for class schedules. As we approach the end of this year, we will be adding the schedule for Visit our events page to view the upcoming courses in your area: How many books should I get out of the long list of reference books? We use the relevant parts of long list of reference when creating and updating the CPIM Participant Workbooks, so the Participant Workbooks can save you a lot of money. What I recommend after you finish the class or are at the end of your studies is to review the Exam Content Manual (a copy is in the CPIM Participant Workbook) and carefully review any area of the Outline for any topics that you still feel don t feel comfortable with. If you can get a satisfactory understanding from the Workbook or your instructor, then you might consider the reference book from which that concept was taken. At the end of each major section of the Exam Outlines, is a list of books and chapters (they are referenced back to the Bibliography later in the Exam Content Manual). You can check just he books or chapters you need to improve you understanding. I do recommend Introduction to Materials Management by Arnold, Chapman & Clive to all CPIM students. It s invaluable for the Basics exam, a primary reference to two of the other exams, and extremely helpful. Can I take the first module class as an -instructor led on-line class and study for the other modules by my own? Yes. You can do any combination of studying for the exams. 12 Is the participant workbook included in the basic class I have signed up for? Most course providers include books for their students. Sometimes they ask students to purchase the books themselves. You will want to ask your class provider if they are included. I am currently a graduate student. Can I give CPIM and I would be glad if students can get any funding for CPIM certification. Is there any special price or offer to college students? As a student am finding the material and Exam fee too costly. Would be glad if you can provide subsidized rates for Students. 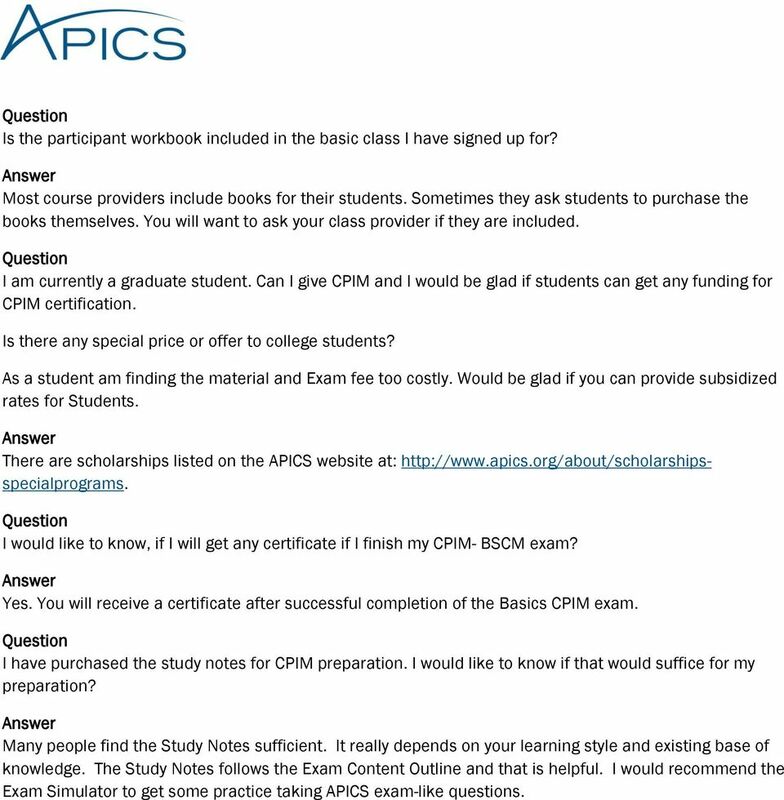 There are scholarships listed on the APICS website at: I would like to know, if I will get any certificate if I finish my CPIM- BSCM exam? Yes. You will receive a certificate after successful completion of the Basics CPIM exam. I have purchased the study notes for CPIM preparation. I would like to know if that would suffice for my preparation? Many people find the Study Notes sufficient. It really depends on your learning style and existing base of knowledge. The Study Notes follows the Exam Content Outline and that is helpful. I would recommend the Exam Simulator to get some practice taking APICS exam-like questions. 13 I see a lot of SCMA certifications in some people's Linkedin profiles, is it the same as CSCMP? CSCMP is an association that is focused on logistics. 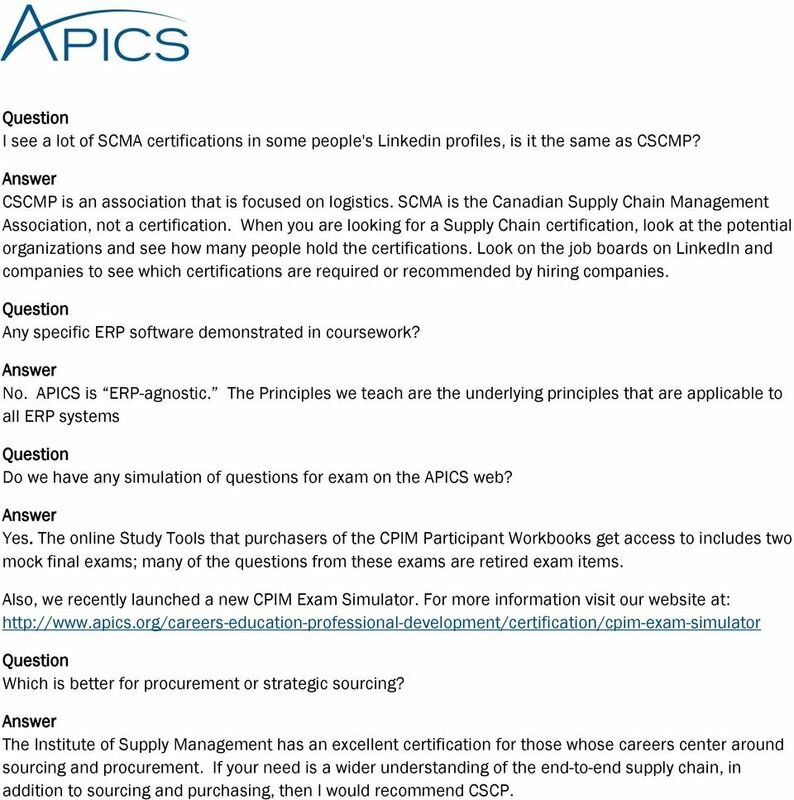 SCMA is the Canadian Supply Chain Management Association, not a certification. When you are looking for a Supply Chain certification, look at the potential organizations and see how many people hold the certifications. Look on the job boards on LinkedIn and companies to see which certifications are required or recommended by hiring companies. Any specific ERP software demonstrated in coursework? No. APICS is ERP-agnostic. The Principles we teach are the underlying principles that are applicable to all ERP systems Do we have any simulation of questions for exam on the APICS web? Yes. The online Study Tools that purchasers of the CPIM Participant Workbooks get access to includes two mock final exams; many of the questions from these exams are retired exam items. Also, we recently launched a new CPIM Exam Simulator. For more information visit our website at: Which is better for procurement or strategic sourcing? The Institute of Supply Management has an excellent certification for those whose careers center around sourcing and procurement. If your need is a wider understanding of the end-to-end supply chain, in addition to sourcing and purchasing, then I would recommend CSCP. CMA Class Frequently Asked Questions Q: Is WE CARE ONLINE approved by the State of Kansas A: Yes, WE CARE ONLINE is approved by Kansas Dept of Health and Environment as well the Kansas Board of Regents. 1 Training Plan Template As described in Section 4.2.1 of the Training Effectiveness Toolkit, a Training Plan will help define the specific activities that will be conducted to carry out the training strategy. It is end2end Academy s vision to equip supply management professionals, at all stages of their careers. A RE YOU SUFFERING FROM A DATA PROBLEM? Make only as much as the customer will buy. Don't make things the customer won t buy - Taiichi Ohno. www.pwc.com/me Helping shape your future Certified Management Accountant (CMA) PwC s Academy 2015 2016 Contents About PwC s Academy 1. About PwC s Academy 2 2. About the CMA 4 3. Getting qualified 5 4. Supply Chain Management An exceptional career opportunity. CLoth from the UK. How to. Schedule PMP Certification Exam? What is the Eligibility Criteria? What to Carry to the Prometric Center?